The Isle of Wight's troubled new "floating bridge" service has been suspended on the orders of the Maritime Coastguard Agency (MCA). 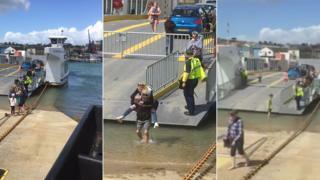 The chain ferry broke down on Sunday, with stranded passengers forced to wade through water to the slipway. The MCA said the suspension was due to "training issues". Isle of Wight Council said "teething issues" were being dealt with. Its manufacturer said it was in "debugging mode" ahead of its official launch. An MCA surveyor said: "We will be re-inspecting the vessel in due course, subject to these issues being rectified. We are confident that the company is working hard to bring the vessel into full service shortly." Crowds gathered to watch the chain ferry begin operating on Saturday, replacing a vessel that had run between Cowes and East Cowes for 40 years. However, cars struggled to embark and disembark without scraping their bumpers and the vessel broke down on Sunday morning. A statement said the local authority was working with the MCA to resolve issues. Sunday's breakdown was blamed on an electrical fault which has since been fixed. "It had always been anticipated that, as with any new vehicle, there would be a period of time for staff and users to become used to its operation. "We would encourage all vehicle users to drive slowly on to and off of the floating bridge," the council said. The ferry briefly resumed operating on Monday morning, before stopping again at about 11:30 BST. The managing director of Pembroke-based Mainstay Marine, Stewart Graves, said the new vessel was still in a "shakedown" period with engineering work and staff training continuing before the official handover next month. "I'm sure we will hand over an excellent product which is reliable and meets the requirements of the council and residents." 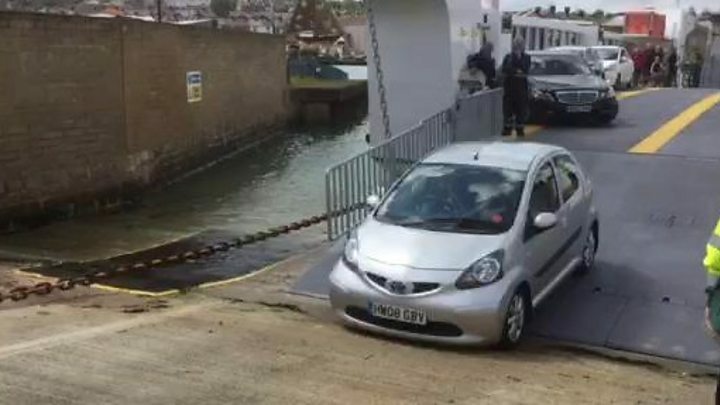 A launch used to ferry foot passengers since the start of the year has been put back in action, while drivers once again face a 10-mile road diversion. The vessel and slipway work has cost £4.6m, of which £3.8m came from the Solent Local Enterprise Partnership.